I distinctly remember negative emotions towards American Idiot when it first came out. My habitual response is still negative. Why? The same reason any level-headed guy comes to despise a good, popular album he should like: Overexposure. Green Day immediately went from the most underrated band in America to the most overrated, as far as I was concerned. The band’s transformation from “those jerks who made that Dookie album” to “the next generation’s poet laureate arena rockers a la U2” was too abrupt for me. From my 2005 perspective, they weren’t just sell-outs, but something worse: artists who were loved because they sold out. A half-decade later, I’ve amended and cooled down from that perspective. 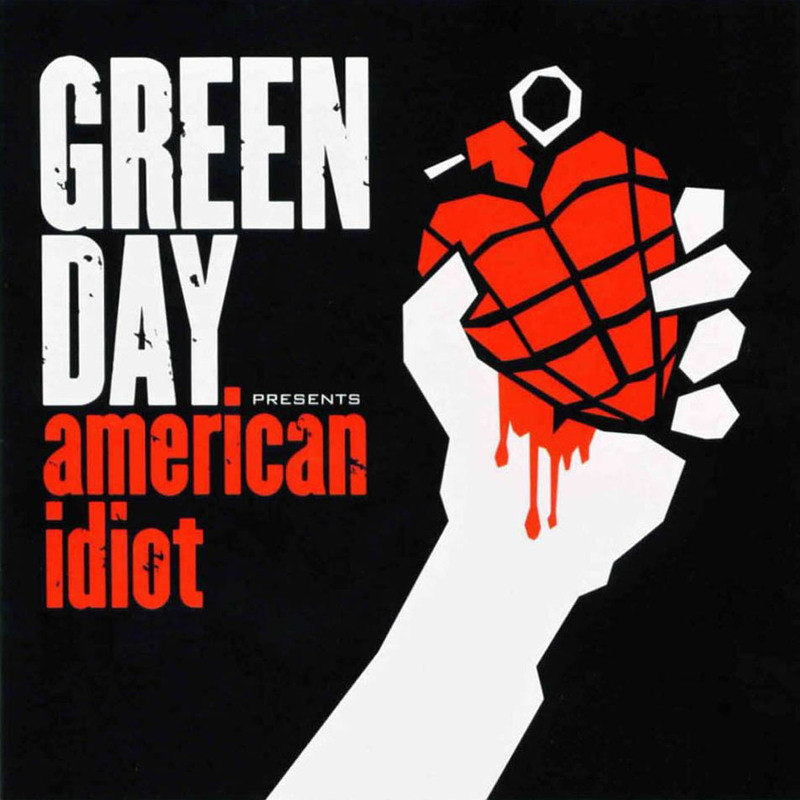 American Idiot isn’t really a selling-out album because it’s not overtly commercial. It’s subtly commercial. It is very angry, which platinum-selling rock isn’t supposed to be. But this anger is so broad and general – to the point where it feels operatic – that it’s relatable to every American citizen. Much hubbub was made by rock critics and news headlines about the political tones in the album but, honestly, I don’t think those are very important to the album. The thinkers and writers who wanted to believe that this album’s success foreshadowed a liberal, politically active generation failed to realize a key point. Almost no one under the age of eighteen who listened to this album connected with it politically. I’d estimate about half were either concerned solely with having loud, catchy guitar riffs blasting from their stereos. The other half connected with the album socially: They feel lonely and bitter and disenfranchised (what this album is about) because they’re awkward adolescents, not because of the neo-conservative military complex or the subversive media machine. Where this album shines are the most emotionally bare and direct. “My shadow’s the only one that walks beside me.” — “Drenched in my pain again, becoming who we are.” — “You taught me how to live in the streets of shame where you’ve lost your dreams in the rain.” Granted, these moments are pretty much entirely depressing and pessimistic. But I think a lot of adolescents and young adults in America are highly depressed and pessimistic, so it fits. Billie Joe has this great voice that connects with just about anyone. It’s always been Green Day’s x-factor, and it really elevates American Idiot from good to borderline great. He doesn’t really tenderness or vulnerability. It’s more resonance and clarity. It’s the rare kind of voice where you feel like you know the guy just from hearing him sing. His voice added an eerie, almost paradoxical brilliance to the self-contradictions of Green Day’s early work. It’s these contradictions and small-scale wonders that I miss the most in American Idiot. The album is content to go bigger, louder, more powerful. It lays the riffs on heavy. It also indulges in nine-minute suites that are mercifully listenable. The more operatic elements of the album sink it down a little bit. The lyrics that directly tackle a third-person narrative fall flat compared to the first-person lyrics of the singles. But listening to the singles and the good album tracks like “Whatsername,” I thought the album sounded even better than it had a half decade ago. Then again, maybe it’s me that’s changed. When I hear “Boulevard of Broken Dreams,” I no longer have to battle the sensation that this song would be great if it wasn’t on the radio every five minutes. I can straight up enjoy it, because it truly is a great single. I don’t doubt in the slightest that the album dubbed an instant classic upon its release will one day be a true classic. Green Day immediately went from the most underrated band in America to the most overrated, as far as I was concerned. The band’s transformation from “those jerks who made Dookie” to “the next generation’s poet laureate-arena rockers a la U2″ was too abrupt for me. From my 2005 perspective, they weren’t just sell-outs, but something worse: artists who were suddenly loved because they sold out. A half-decade later, I’ve amended and cooled down from that perspective. American Idiot isn’t really a selling-out album because it’s not overtly commercial. It’s subtly commercial. It is very angry, which platinum-selling rock isn’t supposed to be. But this anger is so broad and general – to the point where it feels operatic – that it’s relatable to millions of American citizens. Much hubbub was made by rock critics and news headlines about the political tones in the album but, honestly, I don’t think those are very important to the album’s success. The thinkers and writers who wanted to believe that this album’s success foreshadowed a liberal, politically active generation failed to realize a few key points. Almost no one under the age of eighteen who listened to this album connected with it politically. I’d estimate about half were concerned solely with having loud, catchy guitar riffs blasting from their stereos. The other half connected with the album socially: They feel lonely and bitter and disenfranchised (what this album is about) because they’re awkward adolescents, not because of the neo-conservative military complex or the subversive media machine. Where this album shines are the most emotionally bare and direct moments. “My shadow’s the only one that walks beside me.” — “Drenched in my pain again, becoming who we are.” — “You taught me how to live in the streets of shame where you’ve lost your dreams in the rain.” Granted, these moments are entirely depressing and pessimistic. But the adolescents I knew regularly dealt with (what they saw as) emotional bleakness, so it fits. Billie Joe has this great voice that connects with just about anyone. It’s always been Green Day’s X-factor, and it really elevates American Idiot from good to borderline great. He doesn’t really have tenderness or vulnerability. It’s more resonance and clarity. It’s the rare kind of voice where you feel like you know the guy just from hearing him sing. His voice added an eerie, almost paradoxical brilliance to the self-contradictions of Green Day’s early work. It’s these contradictions and a small, measured scope that I miss the most in American Idiot versus their older work. The album is content to go bigger, louder, more powerful. It lays the riffs on heavy. It also indulges in nine-minute suites that are mercifully listenable. The more operatic elements of the album sink the package down a little bit. Any of the lyrics that tackle a third-person narrative fall flat compared to the first-person lyrics of the singles. But just recently listening to the singles and the good album tracks like “Whatsername,” I thought the album sounded even better than it did a half decade ago. Then again, maybe it’s me that’s changed. When I hear “Boulevard of Broken Dreams,” I no longer have to battle the sensation that this song would be great if it wasn’t on the radio every five minutes. I can straight up enjoy it, because it truly is a great single. I don’t doubt that the album dubbed an instant classic upon its release will one day be a true classic. Be sure to check out our review of 21st Century Breakdown, our review of Uno/Dos/Tre, and Grant’s reflection on their career. who would think that a band that had already released a greatest hits album would come out with something like this? Love the song ! I LOVE GREEN DAY <3 it's wonderful !